A notorious far-right blogger may have provoked WikiLeaks' outreach to Donald Trump Jr.
Far-right blogger Charles Johnson may have played a role in WikiLeaks' eventual outreach to Donald Trump Jr.
Trump Jr.'s exchanges with WikiLeaks have earned him new scrutiny this week. Johnson published a story about an anti-Trump website that WikiLeaks then sent to Trump Jr.
A far-right blogger who set up a meeting between WikiLeaks founder Julian Assange and US Rep. Dana Rohrabacher in August may have tipped Assange off to an anti-Trump website that WikiLeaks then sent to Donald Trump Jr. in September 2016. Charles Johnson, who calls himself an independent journalist and runs a site called GotNews, published an article around 9:30 p.m. ET on September 20, 2016, claiming he had "obtained a memo from a George Soros-tied PR firm that is launching a website to spread conspiracy theories about Donald Trump’s connections to Russia." Soros is the investor and business magnate who has become a favorite bogeyman of the far right. "The site, PutinTrump.org, is set to be launched tomorrow morning on Wednesday, September 21, by public relations firm Ripple Strategies," Johnson wrote. Johnson updated his article again to include the password for PutinTrump.org, which was still locked at that point. He said he had obtained it from a "GotNews researcher." "'Let's bomb Iraq' Progress For America PAC to launch 'http://PutinTrump.org ' at 9.30am.," WikiLeaks tweeted at 12:07 a.m. ET on September 21, 2016. "Oops pw is 'putintrump' http://putintrump.org/." "About 2 hours after our original article, Julian Assange’s WikiLeaks repeated our discoveries," he wrote. "Guess which big leaks organization reads GotNews & WeSearchr on the downlow! Come on Julian, let’s work together. WikiLeaks & WeSearchr is a match made in heaven. We can take down Hillary together." WikiLeaks sent the 'discoveries' to Donald Trump Jr.
Perhaps unbeknownst to Johnson at the time, WikiLeaks had also "repeated" his "discoveries" in a private message to Trump Jr. — about 10 minutes before tweeting it out publicly. 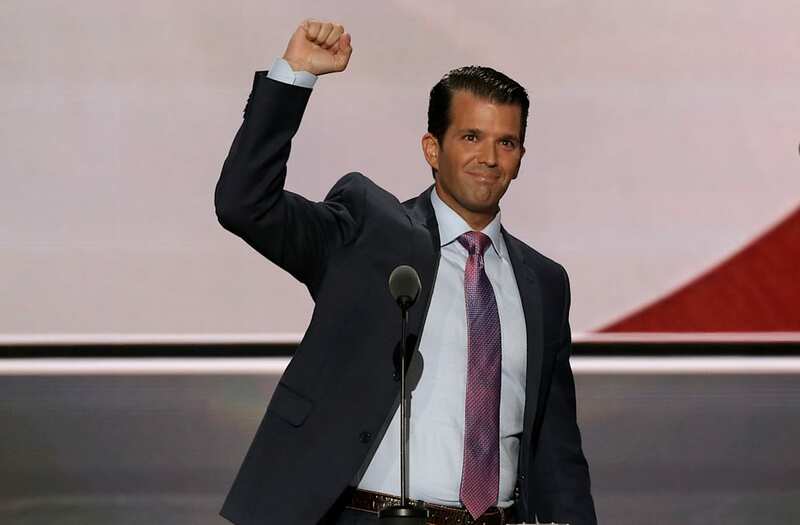 Trump Jr. has come under renewed scrutiny this week amid revelations that he exchanged private messages with the anti-secrecy group during the campaign. Trump Jr. replied: “Off the record I don’t know who that is, but I’ll ask around." It is unclear whether Johnson's TrumpPutin.org story in September marked the beginning of his contact with Assange, who has been living in asylum at the Ecuadorian embassy in London since 2012. Stone told the House Intelligence Committee in September that he knew of Assange's plans via a "journalist" who was in touch with Assange. To the committee's frustration, however, Stone would not reveal the journalist's identity. "I have referred publicly to this journalist as an, 'intermediary,' 'go-between' and 'mutual friend,'" Stone testified. "All of these monikers are equally true." About a month before Stone's House interview, Johnson met with Assange and Rohrabacher in London. The meeting, Johnson told reporters at the time, stemmed from a "desire for ongoing communications" between the congressman and the WikiLeaks founder. Stone didn't immediately respond to a request for comment. Assange reiterated during the meeting that Russia did not give WikiLeaks the stolen Democratic National Committee emails that it dumped in July 2016. Rohrabacher says he has been trying to meet privately with President Donald Trump to relay Assange's message. He told Business Insider last month that chief of staff John Kelly was blocking him from meeting with Trump. "any communications with Russian persons, or representatives of the Russian government, business, or media interests" that relate to Russia's election meddling and the 2016 presidential campaign more broadly. Johnson told Yahoo that he had no plans to cooperate. “They’re going to have to subpoena me and then they’ll be sorely disappointed,” he said.